When Jack was a mere 5weeks old we changed his pushchair as he had outgrown the pram section of his first. Our first pushchair had two individual handles so fine when shopping as we could just hang the bags off those. However, when we purchased the new pushchair it was a solid handle and there was no longer anywhere to put the bags when shopping. I remember seeing these clips within the stores but when I wanted one I couldn't find one anywhere. When visiting the baby show in Birmingham thats when I finally brought my clip. Amazing invention! My Buggy Buddy was launched in October 2008 and created by two policemen from Essex. 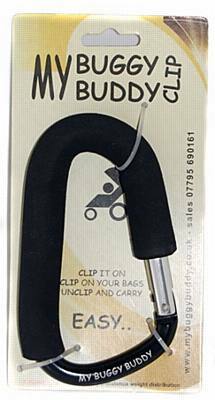 The range started with the 'My Buggy Buddy Clip' and have progressed to create a range of products. From the baby show I purchased both a clip and a lock. The Clip is available in 3 colour choices, black, pink and blue. I opted for black as I felt it would always be suitable. The shape of the clip is like a hiking clip, and is designed from aluminium covered in a foam cover. The smaller part is designed to go onto the handle with the larger part and clip to hang down to make getting your bags on easier. 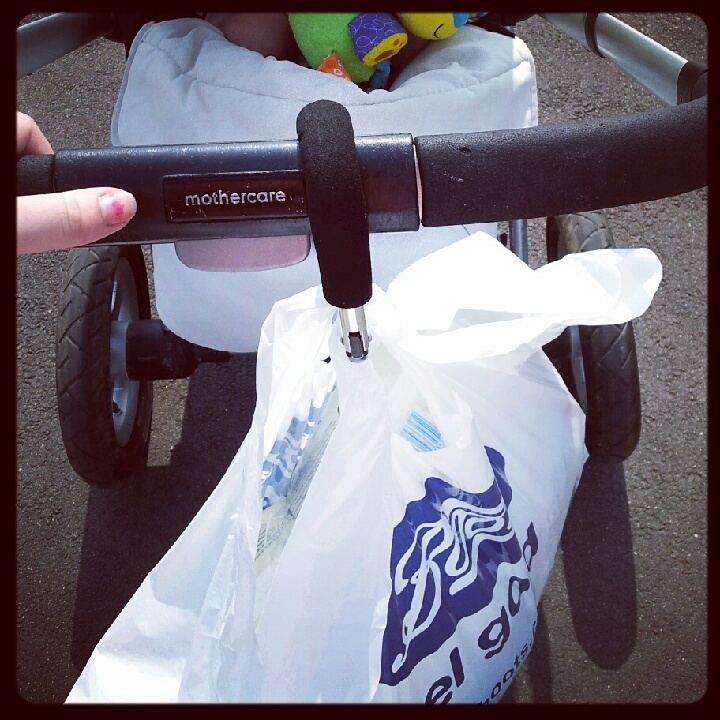 The foam covering saves the clip from scratching the pram and also gives it extra grip. It is designed to help parent's carry bags on their prams safely and securely, keeping them all in one place. However, they do warn you not to overload your buggy as it may tip backwards. The clip is very easy to use, you simply clip it onto the handle and then clip any bags on you may need too. However, when you remove your child from the pram, be sure to remove your bags first to save the pram tipping. How many bags the clip will hold will depend upon your pushchair and its capable carrying weight. The clip could potentially hold a lot of bags though. 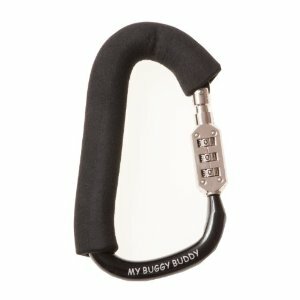 As I stated above, I also purchased a My Buggy Buddy Lock, this is suitable for attaching your handbag too or to attach your buggy to a railing outside a nursery or somewhere similar. This is to save any buggy's being stolen. The only difference between this and the normal clip is this one has a 3 comination lock; this lock is only available in black.